In 2017, WITHOUT our vote, without so much as a discussion here in Macon County, my opponent fought all the way to the state house for a pay raise. He states it is an "expense allowance," regardless of what it is referred to collectively among the 8 who recived the $4,800 boost to their take home pay is now costing the county $38,400/year and "may be treated as compensation for retirement contributions." He is our elected public servant, yet he didn’t think it was important to get our approval. In 2015, my opponent voted his approval for the following taxes: a 5¢ county-wide fuel tax, a new rental tax and a more inclusive occupational tax. In 2011, my opponent voted for the county-wide Business Privilege Fee. As a political favor, my opponent voted for an expensive retirement package, just as if he were a full-time employee. This package includes the county paying for his health insurance until he reaches Social Security age, expensive retirement package. Macon County has lost 20% of our population since 1980 and is projected to lose the most through 2040 of all 67 counties. One-hundred percent of our students are eligible for free government breakfast and lunches. 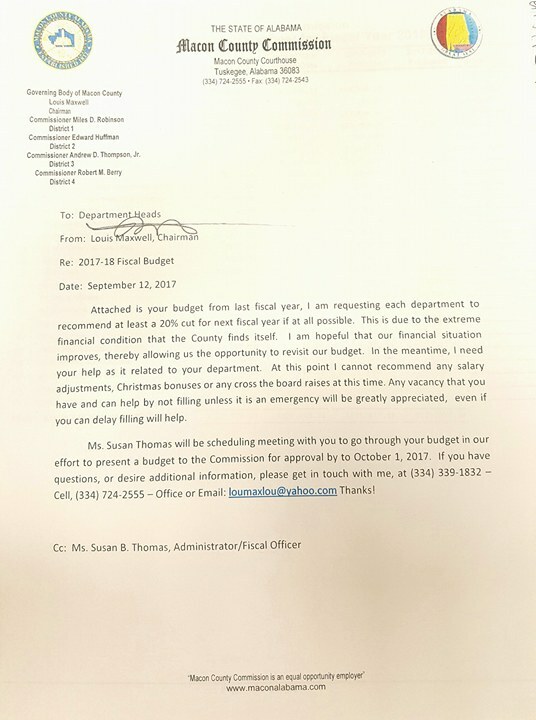 In 2017, our county was financially unable to provide staff a bonus, nor will they receive a 2018 pay raise. The 2018 county budget process began with a 20% reduction of the 2017 budget. The county is leasing 5 new 2017 vehicles (pkg 1, pkg 2) with monthly payments of over $5,000 for 60 months. The county commission works hard to keep citizens' eyes and minds from official county documents. The commission, as I can recall, has not spoken "socioeconomics" in the years I have been attending the meetings. Macon County's Novemeber 2017 unemployment was 4.4%, state average was 3.6%.